As readers of this site are aware, Markets for Good is an effort to improve the system for generating, sharing, and acting upon data and information in the social sector. Our vision is of a social sector powered by information. We recognize that this vision is ambitious, and realize it will require many technical, behavioral, and cultural changes. It will necessitate incentives and support so that organizations are better able to supply information, and efforts to enable and encourage people to make productive use of information. We hope that through the Markets for Good website that we can engage in productive discussions about how we can address all of this. But today we are happy to share with you a first draft of a “vision paper” that signals how and why we think that the sector needs to upgrade its information infrastructure. By that, we mean the architecture that helps to connect, organize and structure information so that it can be supplied and used more easily. 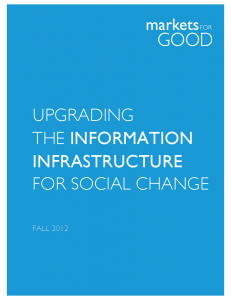 We acknowledge that upgrading the information infrastructure will not change the sector’s use of information overnight, and that other elements are needed to support the free flow of quality data in the social sector. But we believe that in order to move towards a more effective sector, powered by information, we need to begin by strengthening the core building blocks of data exchange. While this paper is an outgrowth of numerous discussions among more than 20 social sector intermediaries that have been part of the Markets for Good collaboration, we realize that we are still very much at the beginning of this journey. As such, we intend this paper to be a “living document” that will evolve over time. We want your input, and we want to incorporate it into successive versions of this vision and into the initiative more broadly. how this is happening today, as well as how we can connect, accelerate, and expand these efforts. For now, we invite you to download the paper and let us know what you think. I applaud Markets for Good for creating this blog and setting out a vision for the use of data and information in the social sector. And the ideas about information infrastructure provide much food for thought. This is a much needed contribution to the conversation about learning and improvement in the sector. However, I worry that without a change in organizational culture, the free flow of high quality information will do little to make the sector more effective. Most social sector organizations, especially nonprofits and foundations, have cultures that set up barriers to learning and change. It’s not so much a problem of access to data and information, but rather a defensiveness and lack of internal support that prevents them from using that data and information. I’ve written about this in my book, Developing a Learning Culture in Nonprofit Organizations, and more recently in a blog post, http://stephenjgill.typepad.com/performance_improvement_b/2012/11/philanthropy-learning-and-change-making.html These issues were alluded to in your “vision paper” but I think they need to be given the highest priority or else all of the work on information infrastructure will be for naught. Where you and I might differ is the opinion that the non-technical issues need to be “given the highest priority”, to use your phrase. I think efforts need to happen on multiple, simultaneous fronts. The reality is, shifts in organization culture and behavior change will take many, many years, and may be influenced by greater, external trends over time. For example, younger, individual donors are much more likely to give online and may help create a shift for individual donors to be more demanding of performance information and transparency by nonprofits. While efforts are underway to help support and incentivize those changes, there are some very immediate needs for upgrading the information infrastructure for our sector and areas where I think new attention can be given. Point taken, Patwater. What do you suggest? This white paper is a great start. Thank you for all of the work you have done and will do to contribute in this space! You do address it in the white paper, but similar to the comment from Stephen Gill above I see potentially the trickiest part as getting nonprofits and funders to embrace a better developed information infrastructure. If nonprofits don’t see this as a clear path to more funding, it won’t happen. So while I know from the paper you are thinking those pieces through, my comment here is to reinforce and encourage that line of thought. I’m also afraid that the project governance piece could be a doozy. It sounds so factual and logical to say “This will include establishing clear decision rights, defining and communicating a funding approach that is open, transparent, and efficient; and creating a plan to monitor key metrics so that progress can be measured and priorities can adapt.” But oh so tricky to do in practice when you are balancing the priorities of a wide cross sector of organizations and funders! I work on a collaboration between about 50 organizations, and sometimes the simplest things can cause the biggest headaches. If you haven’t read the research from Bridgespan on Needle Moving Collaboratives I highly recommend it. Managing relationships is truly a form of art! Hi – very good web site you have established. I enjoyed reading this posting.Thanks for sharing this post.